Surrey coroner Michael Burgess has opened and adjourned for a year the inquests into the deaths of Diana, Princess of Wales, and Dodi Al Fayed pending the results of a police inquiry into the crash that killed them. BBC News Online looks at the issues surrounding the inquests. Q: What are the questions to be answered about the circumstances of the deaths? A: Inquests in England and Wales are limited fact-finding affairs. They focus on who the deceased were; when and where the death occurred; and how the cause of death arose. Expressions of opinion as to who might be to blame are not allowed. But Mr Burgess has asked Metropolitan Police Commissioner Sir John Stevens to lead an inquiry into the crash, to examine whether any findings may have a bearing on the inquest. The move came as the Daily Mirror reported Princess Diana had written a letter before her death claiming Prince Charles was behind a plot to kill her. Q: Will the coroner take the letter by Princess Diana into account? The coroner has said he wants to see any material that could be significant to the inquiry, and that letter could be such a document. But many eyebrows have been raised about the claims made in the letter. "The fact that evidently Prince Charles is named... I think most people would find to be incredible and it would reduce the credibility of that letter," said BBC royal correspondent Nicholas Witchell. Q: Is the inquest likely to end speculation over Princess Diana's death? A: This coroner is very aware that this inquest needs to be comprehensive and definitive. He is facing head-on the speculation and conspiracy theories, by asking the Metropolitan Police to investigate if there are any grounds for such rumours. 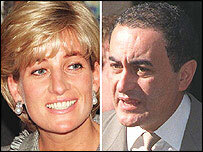 Q: Is an inquest likely to satisfy all Mohamed Al Fayed's concerns? A: Mr Al Fayed, Dodi's father, has said of the inquest: "This is what we have been waiting for, for six years... At last, I hope we can see the light." But he has called for a public inquiry into the Paris crash, saying the remit of the coroner's inquest is far too narrow. Q: Will the inquest re-open old wounds for the Royal Family? A: The Daily Mirror's story and the intense speculation surrounding the death of the princess and Mr Al Fayed will put Prince Charles under pressure. It is also likely to prove very distressing for Princes William and Harry. Q: Why has it taken six years to open inquests? A: Before the coroner began, he had to take into account the findings of the investigations and proceedings in France. These have been going on for years. Only last month a court in Paris cleared three press photographers of breaching strict privacy rules on the night Princess Diana and Mr Al Fayed died. About 6,000 pages of documents have been sent from France to the coroner. Q: Where are the full hearings being held? A: Princess Diana's inquest was opened at the Queen Elizabeth II Conference Centre, London, while Mr Al Fayed's will open in Reigate, Surrey.